to the newest member of the family. Son, Grandson, Brother, Nephew, Cousin. but you knew that, eh? 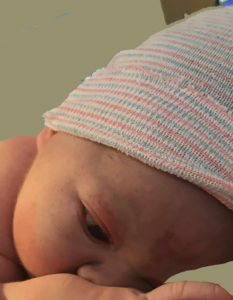 — 9.7 pounds, 22 inches long. He will be called Liam. 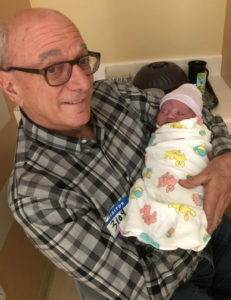 ANYWAY, needless to say, I was thrilled at having the privilege of sharing this first afternoon of William Junior’s life (in the hospital) with Papa Manny (Maria’s father), and Liam’s spectacular parents Maria and William. They were both smiling. Manny and I got to bring some dinner (she wanted a steak) to the proud parents while Diane and Gretta were hanging out with Madison at home. 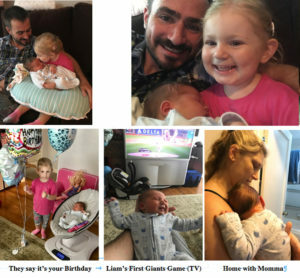 Below are a handful of pictures from William, Junior’s first couple of days in his well-appointed suite in Kaiser hospital in San Leandro and then home. 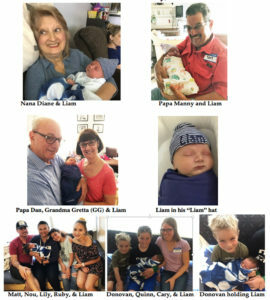 Welcome to our family, Liam! 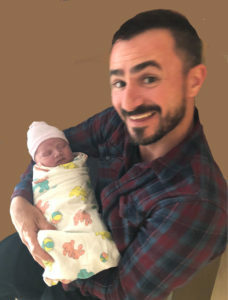 Two Saturday’s ago, we tried a well-known trick to entice the baby to make his Grand Entrance — we took Will, Maria, and Madison to Skipolini’s Pizza in Walnut Creek. It has a long history. Here’s the story: In the spring of 1981, a woman burst into Skipolini’s Pizza, near the end of a long pregnancy (is there any other kind?). She demanded that they give her a pizza that would make the baby arrive soon. Seeing her desperation, the manager concocted a pizza with thirteen toppings, extra onion and extra garlic, and six types of meat. 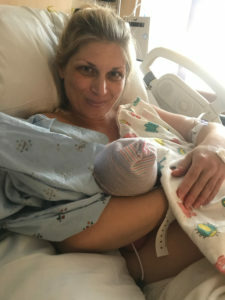 The woman left Skipolini’s after eating the “Prego” pizza and went into labor that same evening. So began the story of the original “Prego” pizza. After years of success, the “Prego” pizza has grown in popularity, recommended by doctors and OBGYNs, recognized on local radio, TV, magazines, and newspapers. SO, here we are, waiting for our “Prego” and hoping to get this show on the road. On the big day, I got an urgent call at 7:30 that it was time to come and stay with Madi while her parents went to the hospital. 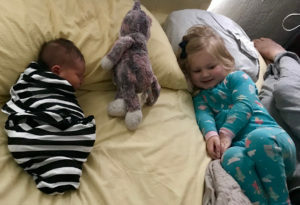 I arrived at 8:00 and Will and Maria swooshed off to the hospital while PapaDan and Madi played with Play-Doh and watched “Paw Patrol.” Meanwhile, Manny and Diane (Maria’s parents) arrived and joined in the serious work in Play-Doh and crayons with Madi, until it was time to take Madi to Vic’s for breakfast. While getting ready to go to Vic’s, the assembled grandparents demonstrated their calm experience under pressure. PapaDan locked the front door while Manny put Madison in her car seat in his truck parked in front of the nearly identical house next door. Diane had a bag of things in the truck to put in the house. So, Dan & Diane purposefully walked up the steps of the porch to the front door. Dan lifted the key to the lock, noticed that the doorknob and deadbolt seemed different from the door he had just locked, but ignored the observation. For a moment, it felt like the right house because there was a dog barking inside, just as Winston had been barking inside of Will and Maria’s house that I had just locked. Manny saved us by shouting, “You’re at the wrong house,” so we walked back toward the right house as the neighbors opened the door. They were most gracious when Diane explained that “our daughter was about to have a baby.” They seemed to understand our condition. We went next door, unlocked the more familiar front door of the right house, placed the bag inside, relocked it, and … we were off to Vic’s. On April 28, 2017, Garrison Keillor will perform at Concordia College, across the street from the Prairie Home Cemetery, in Moorhead, Minnesota, for what he is calling his “Gratitude Tour.” It is the Prairie Home Cemetery that Keillor credits for the inspiration to name his radio program. In a recent Prairie Home Productions news release, Keillor wrote, “Complaint is a mainstay of comedy, so I am now experimenting with a comedy of gratitude, talking about parents, teachers, lucky breaks, dumb things that turned out smart.” My Uncle John would have loved to drive from his house about a mile over to Concordia to listen to Keillor’s comedy of gratitude. From 1974 to 2016, Keillor hosted over 1500 Prairie Home Companion radio shows. That’s an astonishing number. Who knew so much could happen in a small Minnesota town out there on the edge of the prairie? At his 90th birthday celebration, Uncle John with granddaughter Julia. In August of 1974 I was introduced to the Prairie Home Companion radio program by my Uncle John a week or two after he first heard it on the local Minnesota Public Radio station, KCCM-FM, at Concordia College. He graduated from Concordia in 1952; I graduated in 1971. Uncle John brought his bulky AM/FM portable radio out to the picnic table in his backyard so we could listen to his recent discovery where we were eating corn on the cob and hot dogs on a humid Saturday evening. Prairie Home Companion first aired on July 6, 1974, and was broadcast on Minnesota Public Radio from Macalester College in St. Paul, not far from where Uncle John grew up with a younger brother and sister. 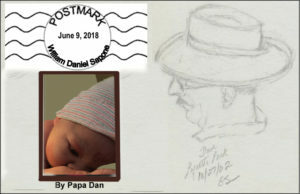 He was born in 1925, and after graduating high school from Minnehaha Academy in St. Paul, he entered the Navy to serve during World War II. In 1945 he was stationed at the Livermore Naval Air Station. 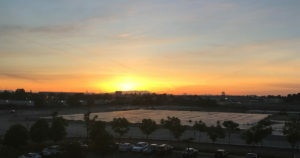 When he and his wife Margaret visited me in the late 1980s in Livermore, we drove down East Avenue past Lawrence Livermore National Laboratory which had been the site of the Naval Air Station. Uncle John was very surprised that many buildings from when he was stationed there were still standing. His parents died in a small plane crash in 1947 near Buffalo, Minnesota, and that tragic, life-changing event brought Uncle John and his brother and sister to Moorhead to live with an aunt. He attended Concordia, where he majored in biology, and found the professors to be especially welcoming and very supportive. All of his life he was a loyal alumnus. This past July, two weeks after the last broadcast of Prairie Home Companion with Garrison Keillor, my Uncle John celebrated his 91st birthday. 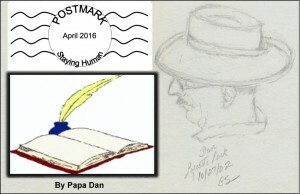 Parkinson’s disease had greatly reduced his ability to speak. His voice was weak and muddled but his intention to engage in conversation was strong. He always wanted to tell me a joke, he always wanted me to laugh, and he always wanted me to listen to “good” music, which for him ranged from a Bach hymn to songs by the Eagles. Uncle John loved telling Norwegian jokes especially the ones about Ole and Lena. I can hear his laugh at the punch line when he told the one about Ole and Lena being married for 65 years, and Ole recounts how Lena had been with him through all his medical problems from gall bladder surgery to liver cancer, and then concludes, “Lena, I’m beginning to think you are bad luck.” Uncle John, who had been married to Margaret 64 years when he died this past September, appreciated the gift of a life-long partner with a tolerant sense of humor. He was familiar with many communities like Garrison’s Lake Wobegon. During his career as a pharmaceutical sales rep in northern and western Minnesota, Uncle John loved talking with the local doctors, nurses, and patients, then heading to a nearby restaurant much like the Chatterbox Café in “real” places such as Ada, Bemidji, Elbow Lake, Pelican Rapids, and Thief River Falls. I enjoyed that first broadcast I heard in 1974 at that backyard picnic table even though there was no news from Lake Wobegon. Keillor did not introduce listeners to the news from where all the women are strong, all the men are good looking, and all the children are above average, until 1977 while I was living in Europe. Keillor reported the News from Lake Wobegon with characters that were reminiscent of my relatives and friends and acquaintances while growing up in Minnesota. I suggested to my Purdue University students and colleagues that they listen to the program. One of my colleagues, a fellow Minnesotan, was an enthusiastic fan of the Prairie Home Companion. She had attended Gustavus Adolphus College, the home of the Gusties and a Swedish Lutheran liberal arts college, in St. Peter. I had attended Concordia, the home of the Cobbers and a Norwegian Lutheran liberal arts college, in Moorhead. We had a spirited, humorous rivalry about Gusties and Cobbers, and about Swedes and Norwegians. We had a common history of the folks we knew living in places like Lake Wobegon. Another Purdue colleague from New York City, proud of his Russian and Jewish heritage, was charmed by Keillor’s storytelling. He wanted to know if what Keillor said was true. He asked questions about unfamiliar things such as Luther League, lefse (a potato bread that looks like a tortilla), and ice fishing. We assured him that everything Keillor said accurately reflected the experiences we had in “real” Minnesota towns. I have recommended Prairie Home Companion to many people since the early 1980s. I was always confident that the two-hour radio program was worth anyone’s time because of its variety of music, humor, and weekly news about people living on the edge of the prairie, in the little town that time forgot out there in central Minnesota’s Mist County. In 1984 when I left Purdue for a career at Lawrence Livermore National Laboratory, I liked telling my new colleagues including Dan Sapone about Prairie Home Companion. Everyone I told had a favorable response and especially to the News from Lake Wobegon. Dan valued Keillor’s storytelling so I was grateful, then, and even more so now, that he taped the presentation Keillor gave at the National Press Club in 1987. I am pleased that I have kept the cassette tape, and I have listened to it numerous times. 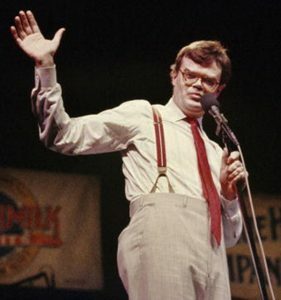 In 1987 Keillor left Prairie Home Companion for 26 months. He explained that he had become too famous because his radio show had four million listeners. He could no longer live in anonymity, which as a shy person he wanted to do. He married his former high school sweetheart, an exchange student from Denmark, and moved to Copenhagen in the summer of 1987. On Tuesday, October 20, 1987, Keillor appeared at the National Press Club in Washington, D.C., to promote his latest book, Leaving Home, a collection of monologues from the Prairie Home Companion. Dan taped that program for me while I was visiting the Oregon Shakespeare Festival in Ashland. It was the week that the Dow dropped 508 points (22.6%, down to 1738.74) and the Minnesota Twins were in the World Series for the first time since 1965. In the question-and-answer segment at the National Press Club, Keillor was asked if he missed his radio show. He replied, “I miss it terribly. I miss singing songs with people who know the words. I have found out that a storyteller has to keep working.” Fortunately, for his listeners he returned to the Prairie Home Companion in 1989. Keillor claimed that “eventually you win.” These days it is harder to believe that. We do not know the future. We do not know what is the worst that can happen. Uncle John enjoyed mimicking an old-time, extremely conservative Lutheran minister with a thick Norwegian accent warning the world about the dangers and evils of “gum chewers, cigarette suckers, and cosmetic users.” It was an amusing, attention-grabbing line because of his powerful voice and his twinkling eyes. I will always remember his warning about the untrustworthiness and dangers of these reckless people. Nowadays they do not simply chew gum or smoke cigarettes or put on cosmetics, rather they say things they do not mean. 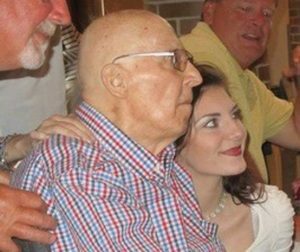 When we celebrated Uncle John’s 90th birthday on July 18, 2015, he was wheel-chair bound, but his bright eyes assured us that he was ready for his party. He could barely speak because of Parkinson’s, but we were amazed and delighted that he could sing along with the Eagles’ “Peaceful Easy Feeling.” There wasn’t a dry eye in the room when he surprised us with his ability to sing. Printed on the inside cover of the program for his funeral service last September: “A good fisherman knows a keeper when he sees one, he knows when to toss one back, and when to head for home.” Uncle John was a good fisherman. He appreciated the camaraderie or solitude of fishing on a lake or along the banks of a river. He enjoyed talking with other people and always found a way to find common ground. He had an infectious laugh and loved to tell a good joke. Even a bad one if it would make you groan. He always expressed gratitude for his wife and children and grandchildren, and for any day or evening he could go fishing. Back in 1987, Keillor affirmed that a storyteller needs to work. 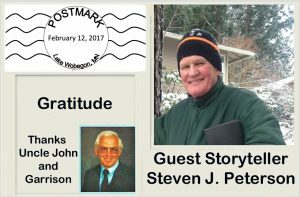 Thirty years later in 2017, he continues to work and Uncle John would have loved to attend the Gratitude Tour this upcoming April. I suspect he would have especially wanted to hear Keillor talk about “dumb things that turned out smart.” I know Uncle John could tell a lot of stories about that. OK. I agree. I am tired of all the negativity (for now). So, instead, I’d like to take a breather from all of that and contribute a little something positive to the mix. Let’s take a look at some evidence that the future, maybe even the present, is brighter than all of that political bloviation suggests. Let’s start with some people on the public stage who work hard to make us smile. Here is my candidate for “people who make us smile.” If you have another candidate, send me some details and we can all smile a bit. 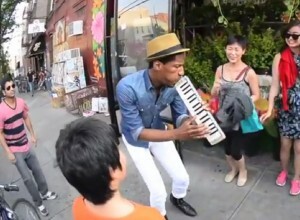 Jonathon “Jon” Batiste is a singer, multi-instrumentalist, educator, and bandleader from Kenner, Louisiana. He has worked with acclaimed musicians in various genres, released his own recordings, performed in 40+ countries, acted in film and TV, and was appointed Associate Artistic Director of the National Jazz Museum in Harlem. Jon regularly tours with his band Stay Human and, in 2012, he was listed on ARTINFO among the “30 under 30” most influential people in the art world. He earned a master’s from Juilliard, and since Sept. 2015 has been the music director and bandleader for The Late Show with Stephen Colbert. From his earliest days, his parents told him to “Go play” and especially, “Go play outside.” So, when he was six, they threw him out on the stage and said, “Go. Play”; so he started playing with the “Batiste Brothers Band.” From those early instructions, he has adopted “play outside” as his trademark and made a name for himself playing on the NYC subway. 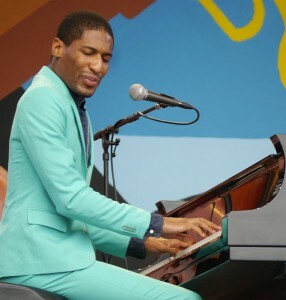 After being mentored at Julliard by Wynton Marsalis, he rose quickly in the music world, leading to a 2013 Carnegie Hall gig, which he began by playing from a seat in the audience. His band, “Stay Human,” which appears nightly on Late Night With Stephen Colbert, draws its name from the belief that the human interaction of a live musical performance can uplift humanity in the midst of the “plug in/tune out” nature of modern-day society. Maybe live music can lift us above the … well, you know. 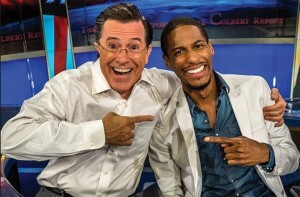 Either on tour or during time off, the band can be seen spontaneously playing in nontraditional venues and starting impromptu demonstrations in the streets — events that Batiste and the band have termed “Love Riots.” He makes a lot of people smile, including Stephen Colbert (and me). Give this TV partnership a try – week nights on CBS — it will make you smile as well. Well, OK. Enough about the bandleader. Can Stephen Colbert make us smile? Try it out . . .
Now, tell me that didn’t make you smile, just a little, eh? – especially the sandwich part. These guys are fun and we need some of that. AND you don’t have to put your head in the sand just to laugh with these guys. If you listen carefully to the jokes, Stephen is telling us a story that we need to hear. If you haven’t seen the show, give it a try. If you don’t like it, I’ll give you a full refund.